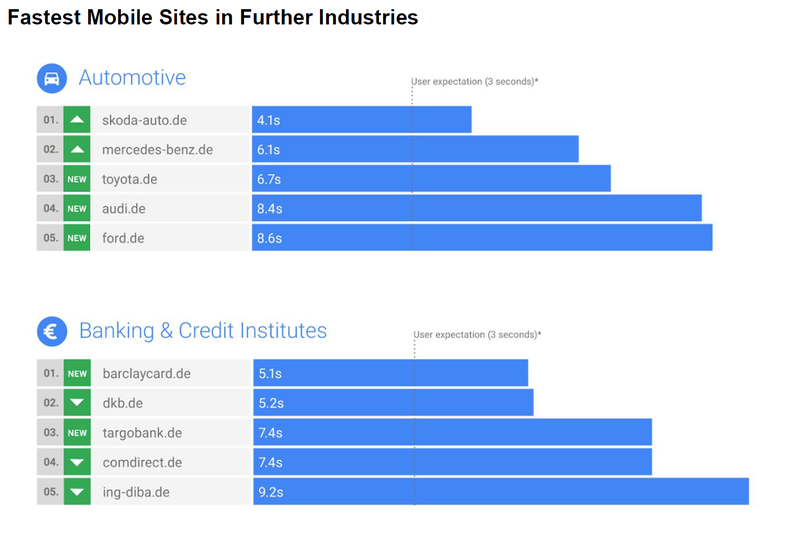 Of the 300 websites examined only 2% of Germany companies truly lead when it comes to meeting consumer expectations for mobile website loading speed. Mobile speed matters — a lot. It’s the deciding factor that determines whether users abandon a mobile website, interact with it or leave it altogether. It all comes down to mobile website loading speed, and research shows your customers won’t wait for more than 3 seconds. Data shows over half (53%) 53 percent of mobile site visits abandon a page that takes longer than three seconds to load. For companies, this is a missed opportunity. 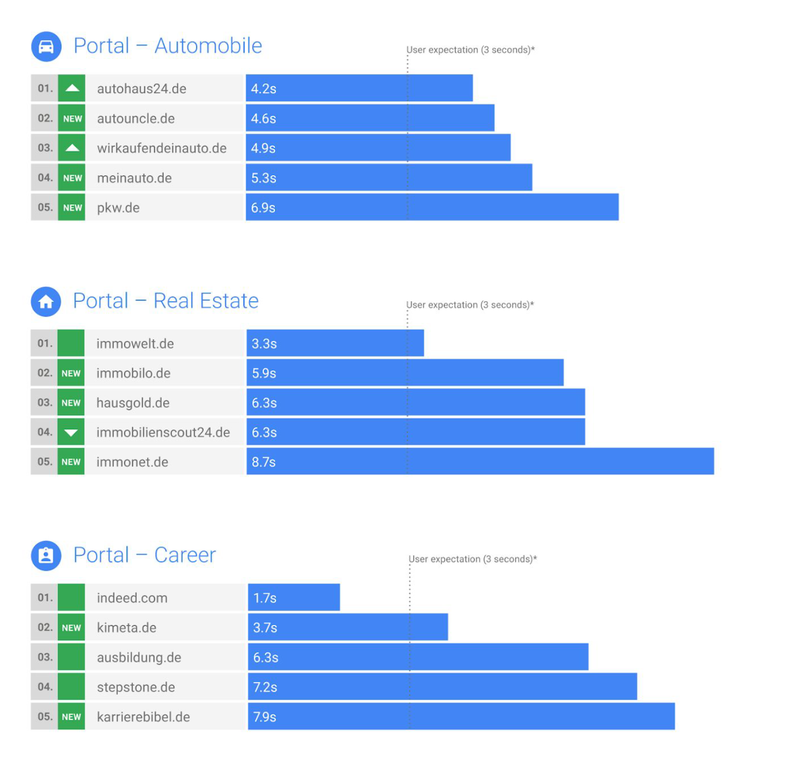 So, how do Germany’s leading websites *really* stack up? 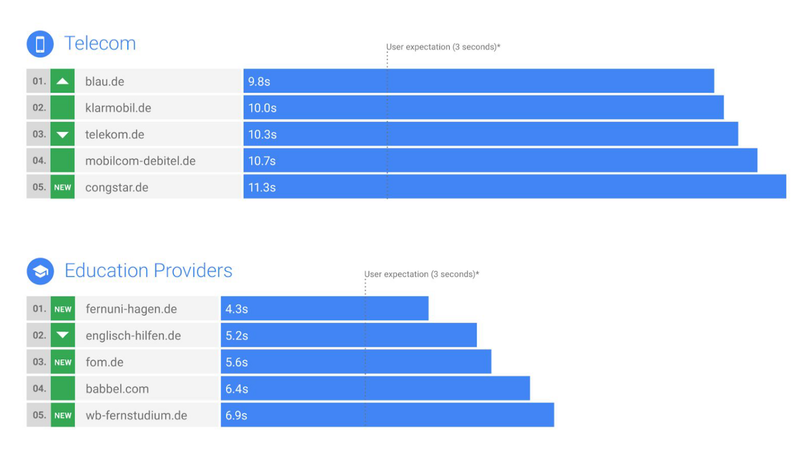 In cooperation with the Mobile Marketing Association Germany, Google has just published the third version of the mobile speed leaderboards, comparing the loading speeds of some of the country’s most visited mobile domains. 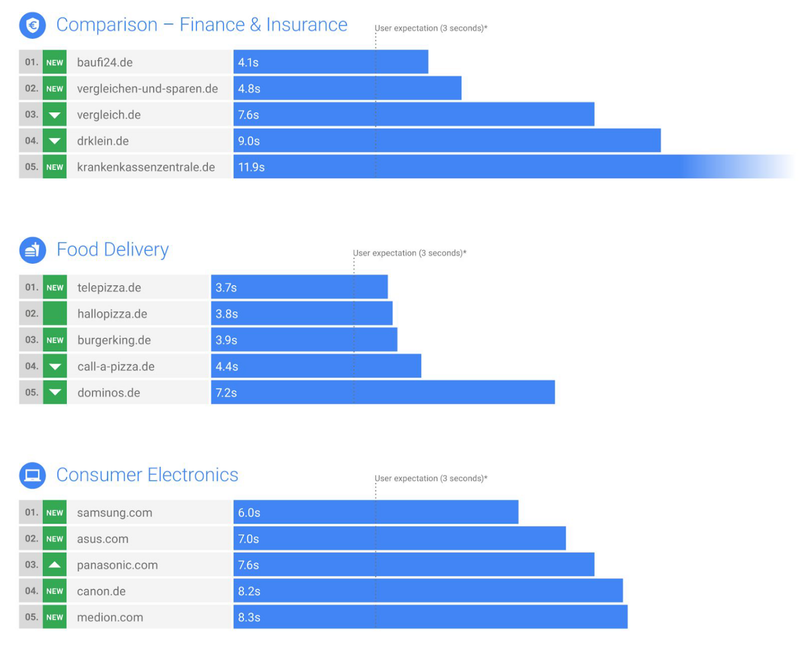 The new leaderboards list 150 of Germany’s most visited websites across 30 categories (including Retail, Travel, Automotive, Finance, Healthcare, Food Delivery, Consumer Packaged Goods and Consumer Electronics) to identify the destinations that meet — or exceed — user expectations. ● Aldi Nord, Mymuesli, Aldi Sued, Zalando and Otto Office had the fastest mobile websites and met user expectations of a 3-second mobile loading time. ● Of the 300 examined websites, only 2% succeeded in meeting user expectations. ● Retail remained the best-positioned vertical. These websites lead the pack with loading times of less than 3 seconds. * Source: Google data, aggregated, anonymized Google Analytics data from a selection of mWeb sites with consent to the publication of benchmark data, n=3.7 K, global, March 2016. 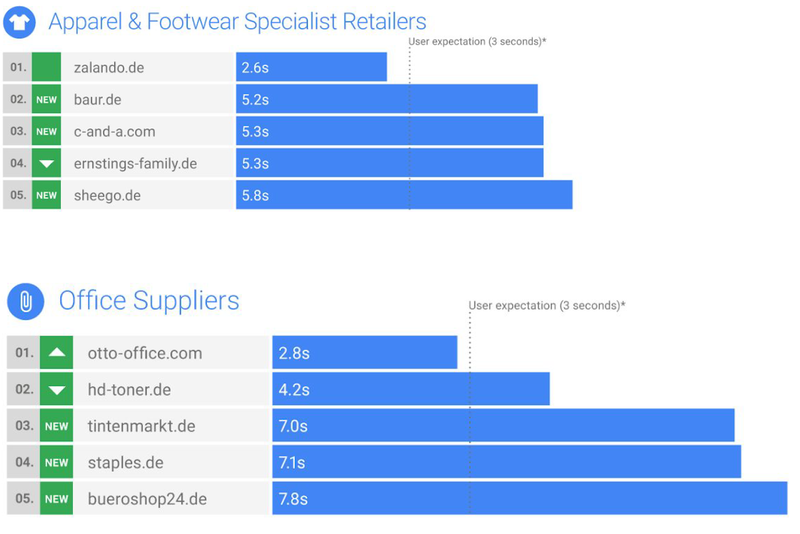 The mobile websites of Indeed, Aldi Nord, Mymuesli, Aldi Sued, Zalando and Otto Office not only meet but exceed user expectations of a 3-second mobile loading time. According to SOASTA, for e-commerce sites, a two-second load-time delay correlates with a bounce rate increase of up to 103 percent. The top-ranked companies have already recognized the positive impact of fast websites on their performance. First and foremost I want to congratulate the winners of their respective categories and particularly the six companies that beat the 3-second page-load user expectation. While users’ expectations are constantly increasing, the results show that only 20% of analyzed sites improved in the last six months. This increasing gap of actual speed vs. users’ expectations represents a huge business opportunity that requires more focus across all industries. In Germany, smartphones are now the primary device for accessing the internet. Little wonder that the loading speeds can decide if a visitor frequents your websites, or bypasses it altogether. But slow loading speeds don’t only frustrate consumers; they deprive companies a chance to reach and engage potential customers. Significantly, German companies are not only becoming more aware of the importance of mobile speed. Many companies have actually improved load speeds to move up in the rankings. The categories Automotive, Beauty Specialist Retailers, Transport and Streaming & Pay TV each had two mobile websites that rose in the rankings. Mymuesli posted the greatest improvement, now loading in 2.5 seconds versus 6 seconds half a year ago. Mymuesli was not only the fastest mobile website in the Food & Beverages category but also the third fastest site in the entire ranking. Otto Office (faster by 2.7 seconds) and HVV (faster by 2.6 seconds) also made significant advances. Smartphones are Germany’s primary device for accessing the internet. In collaboration with Google, we (MMA Germany) want to increase the urgency for faster mobile sites and want to highlight companies successfully prioritizing this topic. 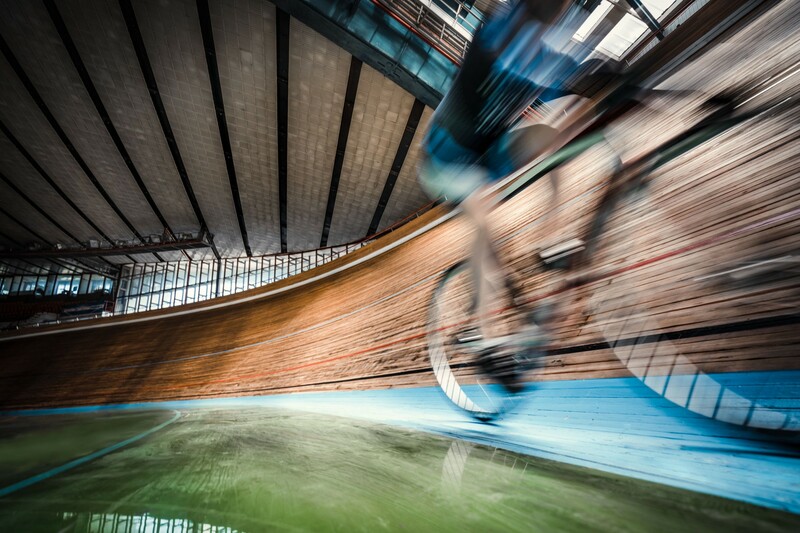 Speed matters and correlates with positive or negative user experience and business growth. Within the Retail sector, sub-verticals Beauty Specialist Retailers, Apparel and Footwear Specialist Retailers, Office Suppliers, Home and Gardening Stores, Modern Grocery Retailers, Internet Retailing, General Merchandise / Department Stores, Electronics and Appliance Specialist Retailers and Sportswear Brands were examined. A fast load time is a crucial factor in the success of an online store. We want our customers to find the articles they want quickly and easily with us — especially in the busy Christmas season. That’s why we attach great importance to the user-friendly design of our myToys shop. 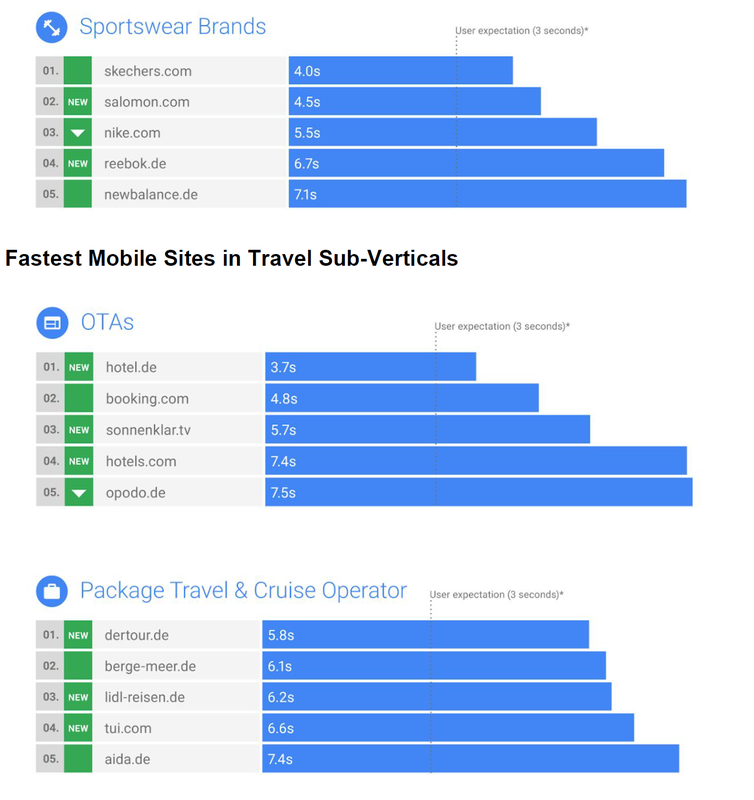 HOTEL.DE delivered the fastest mobile website, at 3.7 seconds load time, for the overall travel industry and within the Online Travel Agency (OTA) category. 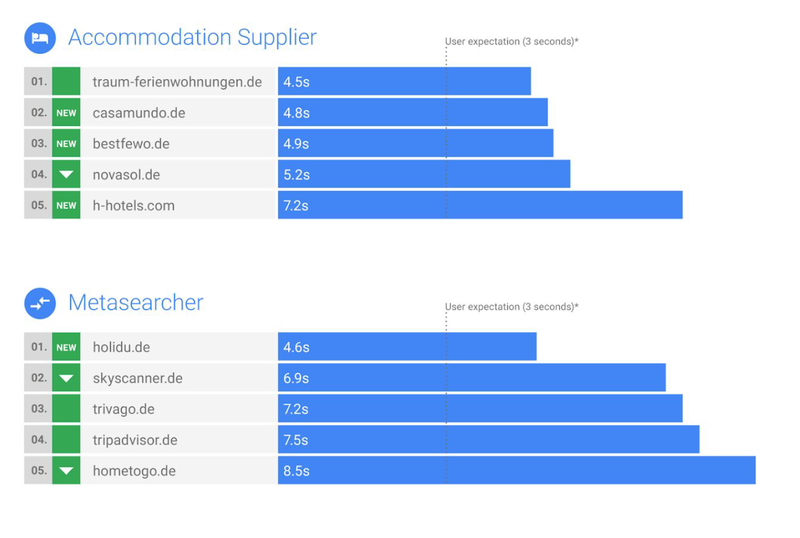 Accommodation Supplier traumferienwohnungen.de (4.5 seconds loading time) and Metasearcher holidu.de (4.6 seconds loading time) follow. In addition, the sub-verticals Package Travel & Cruise Operator and Transport Supplier were included in the leaderboard. Travelers book business trips in a different way than private trips. HOTEL.DE simplifies business travel and supports users to search and book their perfect accommodation in an efficient way — on any device. The fastest mobile loading time is an important factor for a positive user experience and that’s why we are very pleased with the great result and honored to receive this award. As a search engine for vacation rentals, we are very proud to deliver the fastest mobile service in the travel comparison space. The entire vacation rental area is moving towards a completely mobile experience, and speed as a key user experience is a very important factor in this shift. Currently, we have more than 60% of our users come through mobile devices with the share growing every month. Speed and performance are critical to user experience. Our constant commitment to improve both backend and frontend speed is proving to pay off: We have recently re-launched our website, which has a 2.6 second faster page load and resulted in an 8 percent increase in booking conversion rate. Automotive, Finance, Healthcare and Consumer Goods were also included in the Mobile Speed Leaderboards. Waiting is annoying! Fast pages inspire our users and increase satisfaction and conversion at the same time. The first place in the Mobile Speed Ranking rewards our long-term oriented and professional work. Performance is always top of mind when we develop a new product or feature. Especially for mobile users, speed is critical: Our mobile usage rate is at 72 percent and rising. We have chosen the right way — a fact that both the Mobile Speed ranking and customer satisfaction underline. Fast load times are a key success factor for excellent customer experience at Barclaycard. Top-notch performance is a door opener for UX and design impact. Our users have high performance expectations of the financial services industry due to their high product involvement. As we redesigned Barclaycard.de, we focused on the needs of our mobile users and the achievement of the highest accessibility standards from the outset. Our success in the Google Speed Leaderboard is a validation of our ongoing strategy. Mobile speed matters. Here’s your list of next steps to make sure you offer visitors to your mobile website an excellent experience, not annoy them with slow loading speeds. ● Check your status quo with the Speed Scorecard. ● Set a measurable goal for yourself (such as ensuring a loading time of under 3 seconds). ● Find optimization opportunities with PageSpeed Insights and evaluate transformative technologies such as Accelerated Mobile Pages (AMP). 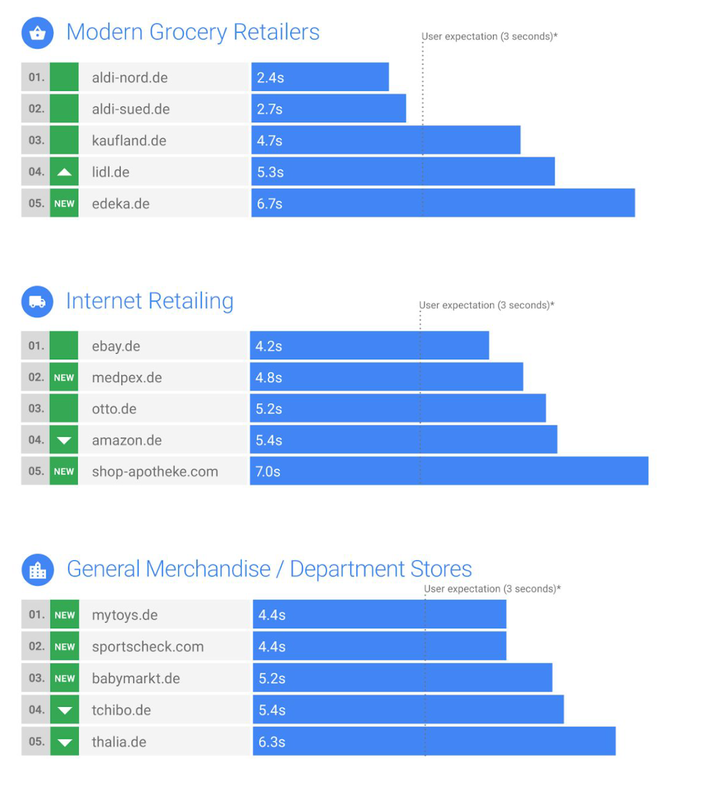 Methodology: Research partner GfK SE identified the ten most frequently visited websites across 30 categories in Germany based on unique users in H1 2018. 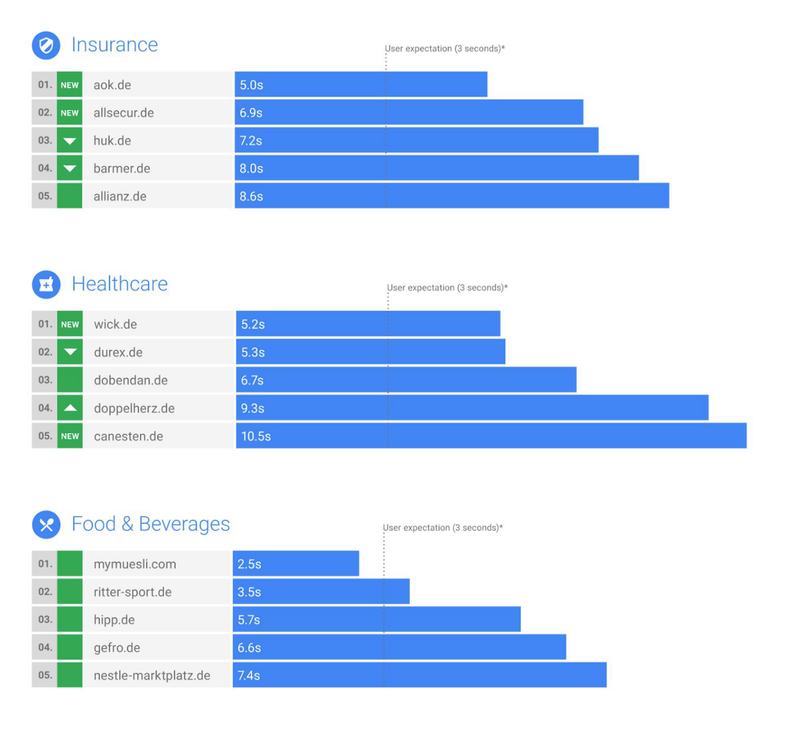 The speed statistics for these domains were then sourced from the October 2018 version of the Chrome User Experience Report (CrUX) (Germany dataset, 3G Internet connection). CrUX includes anonymous and aggregated user experiences of Chrome users across popular domains. The Mobile Speed Leaderboards were ranked based on a combination of three user-centric metrics: First Contentful Paint (FCP), DOM Content Load and Onload. Only the 90th percentile of FCP was used to show speed in the lists. FCP measures the time it takes for the user to receive a visual response from a website. Note that comparisons with other datasets, metrics or tools, such as Webpagetest.org or TestMySite, may lead to different results due to different test environments, time periods or test-setups.